I have something new to share with you. It's called Thriverly. It's a free site. What I love about it is that it's not just for parents, it's a site for parents and their children. You go through a series of questions, and your child answers which category they fit into. I learned a lot about Mica through Thriverly. Thriverly helps you to discover your child's strengths and opens doors to curated activities and videos. They are recommendations based on your child's unique strengths and interests. 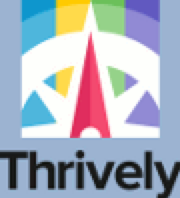 Thrively will start recommending activities based off your child’s strengths and interests. You’ll also see upcoming seasonal activities and the newest activities in your area. I don't know about you, but I'm always on the search to keep my kids occupied, happy, and engaging their little minds. Q: It is pretty easy for me to wait my turn, or even let someone go in front of me in line (yes, even in an amusement park). Q: Which of the following is most true for you? Q: Which statement is most true for you? A: I love to wing with a microphone in front of people and would most likely be the first to pick a song. The questions really helped me to get to understand my son. I think I'm able to answer many of the questions for him, but some I couldn't. It's a conversation builder between parents and their kids. In a busy society, full of gadgets, it's important to me to take time out to have a conversation with my kids. That sounds like a good way to find out more about your kids thoughts. I like the concept of this. I think it's a great tool to use as a conversation starter between you and your kids!